It doesn’t matter to Margaret that her national television debut is tonight on The Nature of Things. As you can see, she is hanging out off Barbados in water that’s about 27 degrees Celsius (who can blame her? ), oblivious to our human world. This is one of the things I love most about leatherbacks. How little we mean to them. Until, of course, we mean everything—when what we do threatens their lives. I don’t know what you will see if you watch the leatherback documentary tonight. We have worked with the filmmakers, Teresa MacInnes and Kent Nason, and TellTale Productions for the last year. We’ve spent hundreds of hours together all told. But the end result—the final cut—has been a secret. But what I can tell you is how hard Teresa, Kent and their fantastic team have worked—through personal tragedy and a compressed timeline and uncooperative weather and failed technology. They have stayed focused and cheerful and determined to help convey the beauty and magnificence and tremendous importance of leatherbacks to our country and the world. And for that we are so grateful to them. So please, if you are in Canada, tune in tonight at 7 p.m. on CBC (7:30 p.m. in Newfoundland). It’s official. Jacquelyn’s transmitter has stopped sending signals altogether. We had no information on her nesting origins when we tagged her. She was our mystery turtle. And so she remains. But, in addition to her transmitter, Jacquelyn has a microchip in her shoulder muscle (called a “PIT”) and small metal tags on her rear flippers that identify her as a Canadian turtle. So when she nests someday, if we’re lucky, our research partners in the south will find her. In our experience, it’s best to be an optimist if you are going to do environmental work. So we’re betting on luck helping us out with this one. 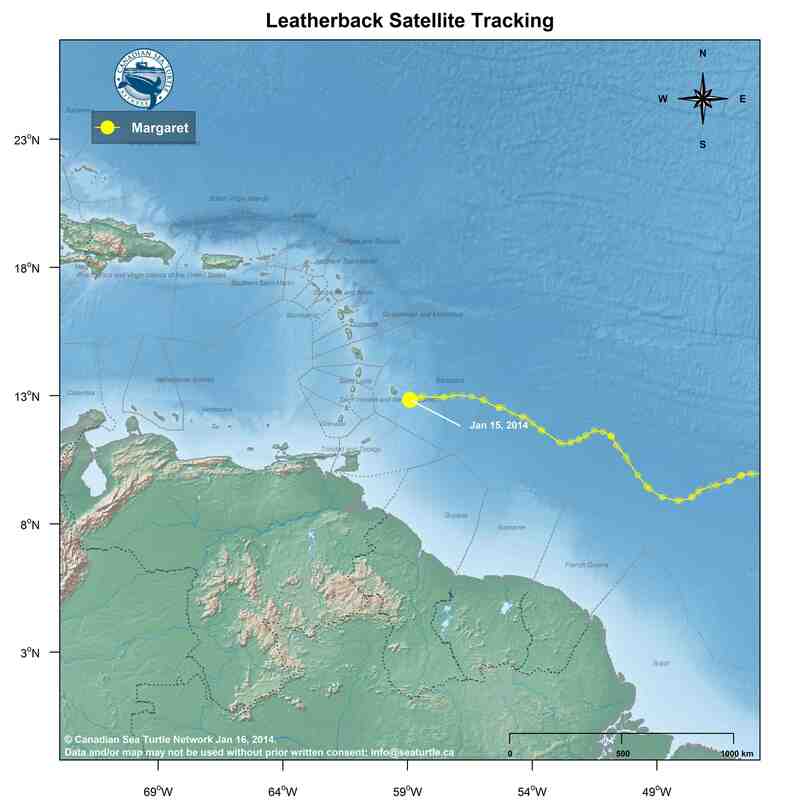 Miss Margaret is still going strong, swimming close to Barbados now as you can see. She has a history of nesting in Trinidad, so we’re curious to see how long it is before she hauls up on a beach. We don’t expect this to happen for at least another month or two. In the meantime, Margaret is going to be on television at the end of January! We’re really excited about a documentary film about our leatherback work airing on CBC’s The Nature of Things on January 30 (at 7 p.m.). The film was made by award-winning directors Teresa MacInnes and Kent Nason and produced by Tell Tale Productions. You can check out the “Behind the Scenes” trailer here. Our turtles’ tracks are no longer hugging tightly to one another. Instead, you can see Miss Margaret making her way toward the nesting beaches. 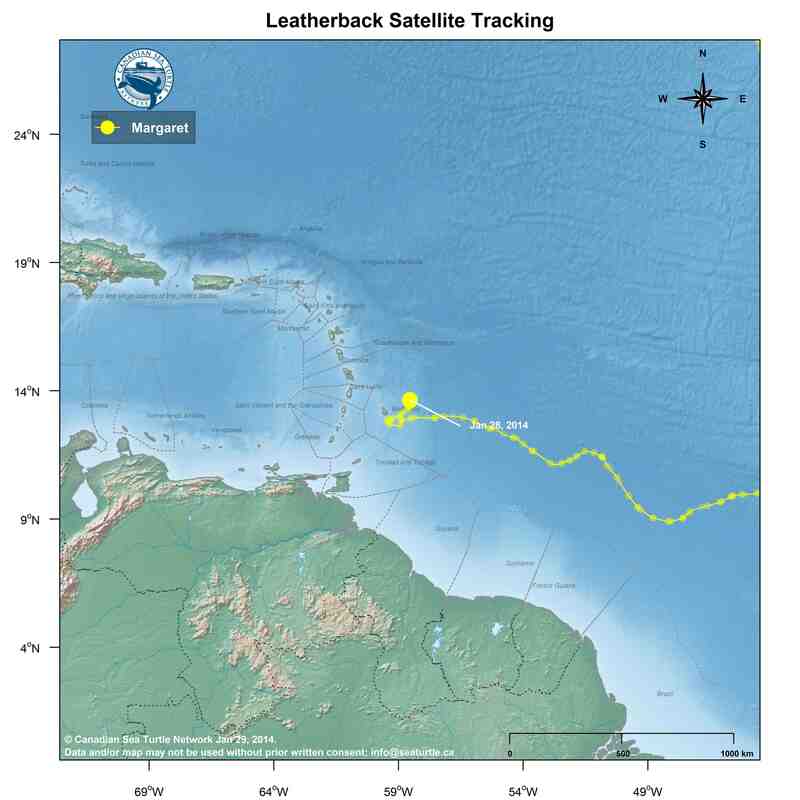 We know that she has nested in Trinidad before, so we ultimately expect to see her land there. You’ll note that the last date for Jacquelyn’s track is January 5. This is because we haven’t had a good quality location from her transmitter since then. We’ve had some poor quality locations over the last few days and have heard nothing yet today. We aren’t worried that something has happened to Jacquelyn herself at this point. 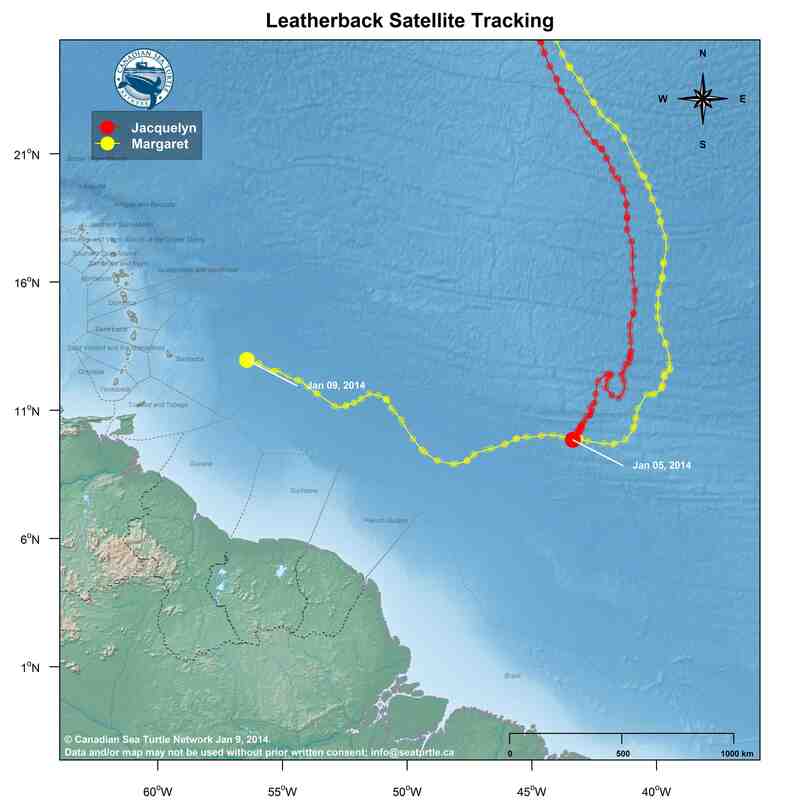 We suspect instead that there may be epibionts (organisms, like barnacles or algae, that live on other organisms) growing on her satellite tag, preventing it from working properly. When this happens, we say that the tag is “biofouled.” Biofouling is a problem because it prevents the salt-water switch on the tag from drying out properly. 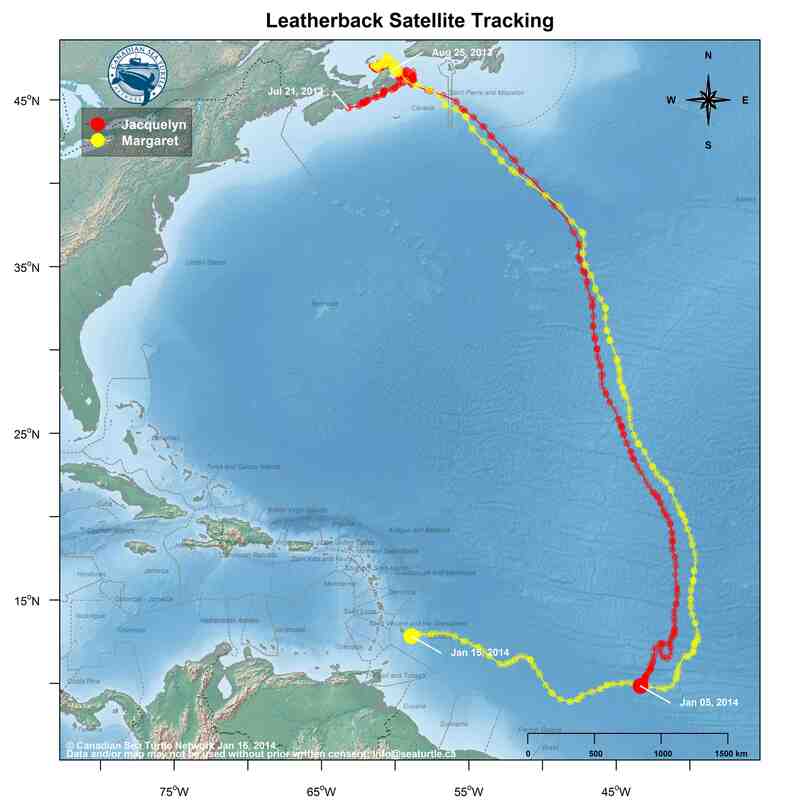 When the salt-water switch is dry (which normally happens when the turtle is at the surface of the water), the satellite tag transmits data. If the switch isn’t dry or if it is covered, the data is not transmitted. We’ll have to wait and see what happens over the next week or two.